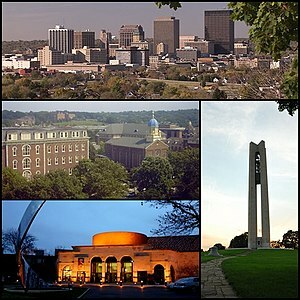 Dayton is a large city in the American state of Ohio. It is where Orville and Wilbur Wright grew up. The Wright-Patterson Air Force Base, also near Dayton, gets part of its name from the Wright brothers. The National Museum of the United States Air Force is inside the Wright-Patterson Air Force Base. ↑ "Population Estimates". United States Census Bureau. Archived from the original on 2016-06-02. Retrieved 2016-05-28. ↑ "Zip Code Lookup". USPS. Archived from the original on November 23, 2010. Retrieved December 2, 2014. This page was last changed on 28 June 2018, at 03:43.